Nepal is still in its infancy in modern Science and Technology (S&T) education, since formal science education started only in 1919 at Tri-Chandra College. Education was still a commodity of privileged few until the end of Rana regime in 1951. The establishment of Tribhuvan University in 1959 and the introduction of post-graduate education in natural sciences in 1965 are the key developments in institutionalization of science and technology education in Nepal. Since, several public and private institutions with research and development (R&D) activities have started. 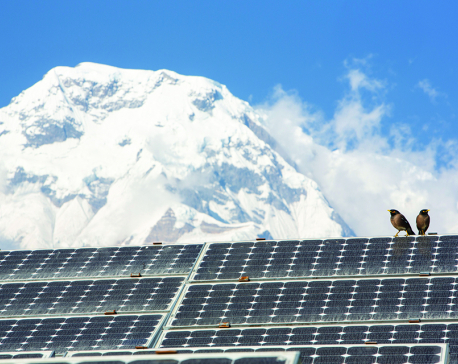 However, it took two decades before Science and Technology policy was explicitly drafted for the first time in the Sixth Five Year Development Plan (1980-1985) in Nepal. Considering the social, political, and economic constraints and the late entry, the pace of science and technology development in Nepal is still admirable nationally. However, this pace is not sufficient to ensure competitive position of the country even in the regional S&T sector, let alone in the global arena. Science and technology in the context of developing countries like Nepal is not so much about pushing the scientific frontiers, but more about enabling the use of innovative technology and resources in diverse domestic context to uplift the living standards of people. There is insufficient intervention of S&T to expedite maximum utilization of abundantly available natural resources like water, medicinal plants, minerals and fertile land in Nepal. Science education in Nepal does not prepare youth to create innovative solutions and enterprise to solve the problems on the ground. Lack of incorporation of science and technology education as a key national agenda exacerbates lack of entrepreneurial S&T human capital and initiatives to maximize the benefits from these resources. Current S&T budget in Nepal is a mere 0.3 percent of the total budget. However, experts point out that the provided data is not well consolidated to account for all the S&T expenses and it mainly reflects the R&D expenses. 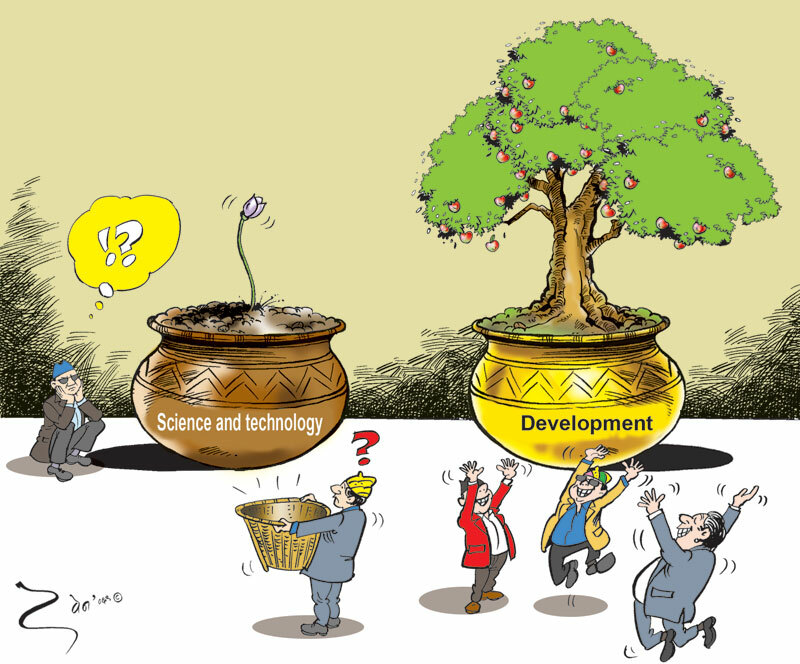 Unless there is a strategically planned emphasis on quality and contextual science education in Nepal starting from primary level all the way up to post-graduate level, pouring more resources only on R&D infrastructure will not solve the problem of brain drain, non-uniform access to quality education and lack of S&T enterprise. The metric of successful S&T professions in Nepal is often considered as becoming medical doctors and engineers. All other science professions are not yet as appealing in our society. This mindset also drives the strength of science education and skills of S&T human capital in our country. Classroom teaching that mainly emphasizes on theory does not equip students well to assess real life challenges and come up with innovative technical solutions. This breeds job-seeking mindset rather than job-creating mindset even among youth with great potential, but without resource and guidance. Therefore, it is not encouraging for the young innovative minds to explore other science-related professions like scientists, educators, science and technology entrepreneurs etc in Nepal. So they go abroad for study and work opportunities. Our education system still follows outdated pedagogical framework where teaching is talking and learning is listening, assessment is summative, and knowledge is factual and procedural. Countries like China, Singapore and India that have progressed significantly in science and technology are also following similar teaching style with year-end high stake examinations. Yet they have made some mark in this field in the recent times. So what is the key to their success in science and technology education? Few practices followed by these countries include use of technology that is relevant to the domestic needs, trainings geared towards utilization of local resources, interdisciplinary and collaborative approach to education, incorporation of technology in the classroom, and creating human capital with skill-sets that match industrial needs. Did we successfully bring the form, but forgot the function? It is therefore imperative to learn from the best practices of the countries that are in the forefront of science and technology and devise S&T reform strategies relevant to Nepal’s context, before dismantling the existing framework. Education system should encourage deeper learning than exam-based learning. The national examination assesses all the students nationwide with the same assessment method. However, educational funding, geographical and socio-political needs, and quality of instruction are very different from one region to other creating disproportionate human capital and unfair competition. Currently, there is a push from the government for public-private partnership (PPP). PPP model has to be implemented in science education as well. Private schools in Nepal are far more well-funded and considered much better for overall educational development and science education of a child compared to public schools. PPP model in science education will ensure greater investments, efficient management, better alignment among all the stakeholders, and cross-sectoral synergies. There are many not-for-profit and private organizations in Nepal like Teach for Nepal, Karkhana, Srijanalaya and Open Learning Exchange Nepal that are contributing in innovative ways to tackle issues in the existing educational framework mainly up to higher-secondary levels when the students have to decide if they want to study science. Most of these organizations are led by Nepali youth who craved for practical knowledge rather than exam-led learning in Nepal. Some of them returned to the country after pursuing higher-level education abroad and some stayed back, with a determination to introduce educational methods that entertain students’ curiosity and creativity, the two vital factors necessary for innovation. The educators in these organizations aim to demystify science, mathematics, and other subjects by presenting complex problems in interesting ways with the abstraction of theory strongly linked to everyday life. There is much to learn from the best practices within the nation as well. It is hard to conclude that the current framework of science education is still relevant to prepare young people for domestic need or for the complex demands of globalization where technologies are being replaced at an increasing pace. Thus, governmental policies and efforts have to be aligned with these kinds of external interventions to achieve sustainable nationwide impact. Strengthening science and technology education can be a crucial stepping stone towards creating and retaining skilled human resources that can contribute to sustainable development of the country.